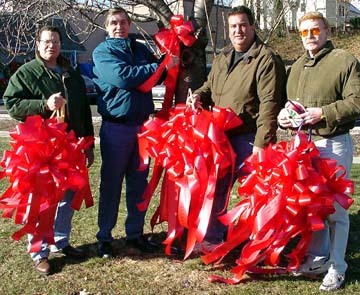 ... and get a Beautiful Red Ribbon on "The Boulevard" with your name on it! Your $10 contribution will be used by the Center For Food Action to purchase food. The Center For Food Action is a non-profit food center that has served our area's needy. Donate $50, and your contribution will provide a special breakfast and a traditional dinner this Christmas or Hanukah for a family in our neighborhood. Special ribbon embelishments will denote your generosity. Center for Food Action welcomes basic non-perishable food items such as juice, cereal, canned goods, pasta, baby food, etc. Food items should not be open, expired or in glass jars. 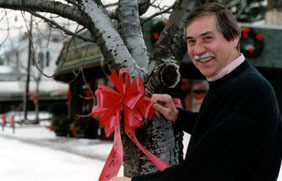 Bill OShea placing a red ribbon at the Circle in Hasbrouck Heights during 1998.